Sente and Papers are popular Mac utilities to handle academic articles. Papers focus on organization, reading and annotation of articles, whereas Sente’s primary function is bibliography management (citing articles in your own publications and creating bibliography lists). This post covers the workflow for using Papers and Sente to handle your references. This post was written before Papers2, which introduced managing bibliographies and many other improvements. First, a few words on whether to use Papers or Sente. The advantages of Papers is that it has great Mac-style user interface and is also available on iPad. Its greatest disadvantage is that it cannot handle bibliographies. Although it allows you to enter bibliographic information, it does not integrate with word or text processors. Thus, you need to export your Papers database to one of the common formats (BibTex, EndNote, etc.) and then import it to a bibliography manager (e.g. EndNote, Bookends, Zotero or Sente) before you can cite in your publications. In other words, Papers presumes that you first read (and annotate) your articles, then select which ones to use in your writings, convert the references to the right format and then cite them. Such a workflow does not work for me, because I usually turn to reference articles in the process of writing, not separately from it. I would start writing, then find the needed article, quickly find the citation I need, refer to it (with page numbers etc.) in the text, and insert the citation. In the process I often stumble on another article (cited in the first one) I need to read, download and tag it, quickly read and refer to it in my text. I don’t want this reading, writing and thinking process to be disrupted by exporting and importing bibliographic information from one software to another. Sente fits smoother into this workflow because it allows you to integrate your pdf file library with your bibliography. You can find your reference materials, read, annotate and cite them within one program. Sente has other advantages, for example it allows you to synchronize your reference libraries between two or more computers. You can even share your reference library with a co-author over the Internet so that you use the same bibliography. At the same time, Sente has a clumsy and not very intuitive interface and a number of other irritating drawbacks, for example it does not provide hints for existing author names leaving a room for spelling mistakes when you enter author information. Nevertheless, I use Sente as my standard reference manager for the lack of better alternative (I have tried EndNote, Bookends, Zotero and Papers and found all of them inferior to Sente). This post is about Sente although the users of Papers may find it useful as well. Here is how I handle my reference files in Sente. First, I almost never do it right when I receive or download a file. This is because in the ‘processing’ flow I am receiving a lot of input and trying to quickly make sense of it (as described, for example in this entry on email workflow). Opening Sente, importing the file and finding the right citation disrupts this flow. The process of importing an article into Sente is rarely fully and smoothly automated. A lot of small decisions need to be made which contribute to decision fatigue and reduce my focus on processing at hand. Moreover, I may get distracted by other references I run across when identifying the citation, or be tempted to read the article, or get carried away in many other ways. What I do instead lets me process each reference file in a few seconds and fully automatically. As described in this entry I download the file to a specific folder, assign tags through DefaultFolderX and let Hazel to move it automatically to my file library. Thus, in my experience, working with Sente is best done while thinking, reading or taking notes. For me such moments often come during the time allocated for writing projects. There is of course nothing wrong with Sente-ing your files when you first collect them if it does not disrupt your flow. In any case, I suggest to follow the following steps. 2. Now you can either use the Import command from Sente or simply drag your file to Sente’s References item (at the top of its sidebar). Sente will search Google Scholar and other online databases to suggest the best citation for your file. You can also enter or correct the citation manually. Once you finished entering the information Sente will rename the file and move it to the right folder. 3. There are several easy methods to find articles in Sente. First, if your file is tagged with OpenMeta tags (as all your reference files should be – see the explanation here), all standard file-finding methods will continue working. 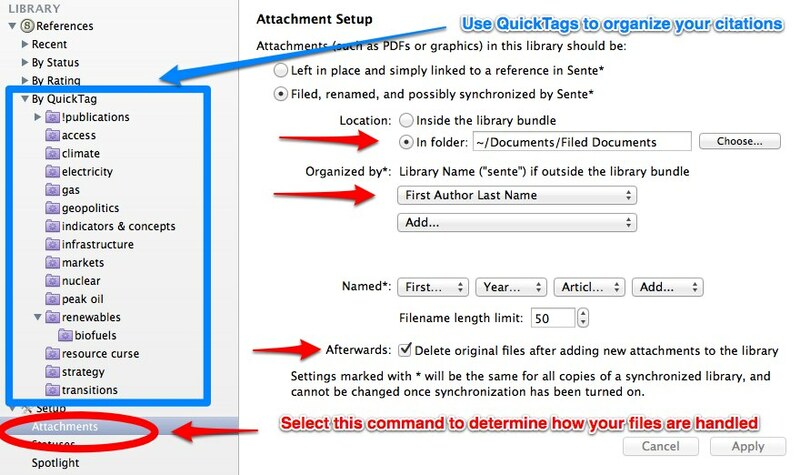 If you have a file in Sente which is not Open-Meta-tagged, you can quickly correct it by Revealing the file in Finder and then using Tags or other application to assign tags. Second, you can now access your files through an old-fashioned way of drilling down the folder hierarchy (e.g. ~/Documents/Filed Documents/Sente/Johansson/… for all files with Johansson as the first author. This is great if you want, for example, to email or copy to an external drive several articles from a particular author . Third, for finding citations you can use the Search field in Sente. I also assign QuickTags in Sente as shown in the picture above. They are not OpenMeta tags and I do it more for my peace of mind: I like being able to see all my bibliographic references for a particular topic. I also use Sente’s QuickTags to mark references which I cite in individual publication projects (it may be useful if you’re asked e.g. to provide an EndNote library of your references for the publisher – then you can just export all references marked with the relevant QuickTag). QuickTags are easy to assign through pressing ⌘-Shift-T and they can be hierarchically organized. Finally, Sente allows to create “Collections” which are similar to folders (or Albums in iPhoto or Playlists in iTunes). One source of frustration that I experience with Sente is that their matching method, particularly relying on Google Scholar is not very exact. Reference types are often mixed and page numbers for articles are not shown. This means that I often prefer to download exact citations from journal website (Sente has an elegant method of doing that). Sometimes you can download pdfs and match them with these citations (with an added benefit of pdf files ending up exactly where they need to be on your hard disk). In other cases, I first download a citation, then get the file and then drag the file from Finder to the citation in Sente. While associating the file with the citation, Sente also renames and moves it to the right directory. This entry was posted in Annotation, Bibliographies and tagged DefaultFolderX, Hazel, OpenMeta, Papers, Sente. Bookmark the permalink. Sente also has an iPad version, which is ok (not great though) for reading articles (highlighting/taking notes). It is superior compared to Papers in that you can see all your highlighted text (if highlighted as “quotes”) in a single list. So you don’t have to flip through all the pages to see where you left notes. Any thoughts on how Papers 2 stacks up to Sente now that it has bibliographic support? I’m debating upgrading to 2 vs. moving out of papers completely into either Zotero, Sente, or Mendeley. Its nice to see the details of a customized workflow that has been carefully thought through! I am abandoning Sente in favor of Papers2. Most importantly they introduced the possibility to cite and include bibliography. I will soon share my impressions here. Thanks for the comment by the way! Could you elaborate on your reasons for abandoning Sente? I moved from Papers to Sente 6 last year, but I have been having second thoughts since seeing the latest (December) version of Papers2. Both appear to competently handle insertion of bibliographies into writing projects, but Papers2 seems to be slightly more user-friendly. First, I find user experience of working with Papers 2.0 much more pleasant than in case of Sente. This is important because liking the interface means I am more likely not to resist adding items to Papers (and organize my library). Secondly, Papers 2 finally bridges the gap between an application that handles pdf files and bibliographic software. Sente is not that good for finding your files if you simply need to email them, for example. So you need to have separate file-handling arrangements. In Papers 2 you can find your files without opening your application and you can email them right from there. Journal merging, Auto-complete, Finder spotlight integration, Multi-editing, and much more. BTW nice blog Aleh.. cheers! Open-meta tags integration? Not yet? Can’t see any OpenMetaTags-Integration working in Sente. Do I miss something? I imported a journal article as pdf, the pdf has metatags – the tags neither translate into quicktags nor are they found via the search…? Cristian, there are no Open-meta tags integration in Sente (or in any other bibliographic software I mention on this blog). In fact Open-meta is supported by a limited number of (very useful) applications – you can check it on the Web. So what I do is always “Reveal file in Finder” and then assign Open-meta tags with Tags or similar software. This means my pdfs are tagged independently of what bibliographic software I use. Would be so perfect to have a integration/two-way sync between OpenMeta-Tags in the File System (and DevonThink!) on the one hand and QuickTags in Sente on the other. Your workaround (“Reveal in Finder”) is nice, but when searching for references to a specific topic you always have to run searches across both Sente and Spotlight b/c you can’t sure where you put in the relevant keywords/tags etc. I agree that’s a pity. Yet I guess it’s not very trivial because you want to tag both the file and the linked reference entry in Sente database. I hope one of the bibliographic apps will realize the importance of OpenMeta. Or may be someone can write an AppleScript to convert Sente/Papers keywords to OpenMeta tags. Anyone? This was very useful, thanks for the guide. Two years later, the stability issues in Papers3 have pushed me to using Sente, which has not changed much. I hope writing papers with Sente will not prove too problematic! What are you using currently for the Mac?